Recognized for over 50 years as the best-paced and most comprehensive guitar method available, Alfred's Basic Guitar Method has introduced over 3 million beginners to the joy of playing guitar. This updated and expanded edition features a new layout, making it easier to read and learn. Now included are blues, country, folk, jazz, and rock styles, plus more pop songs! Learning to play has never been easier or more fun than with Alfred's Basic Guitar Method---the first and best choice for today's beginning guitar students. 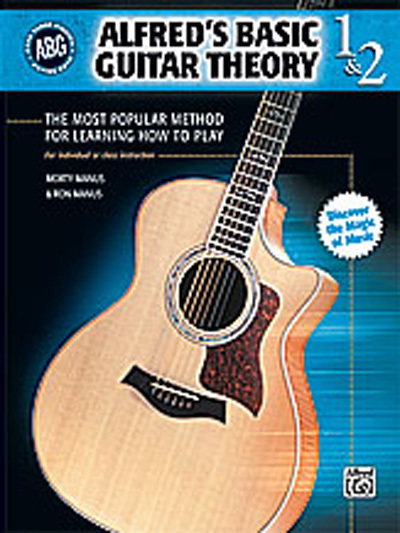 As part of the ABG series, Alfred's Basic Guitar Theory, Books 1 & 2 will help any guitarist enhance his or her knowledge of theory. Note and rhythm reading, scales, chords, and progressions are just some of the topics covered. Use this book alone or to supplement any method.